When John Carpenter was hired to create a low budget movie about a serial killer who targets babysitters, no one realized he would spark a phenomenon that would dominate the horror genre for well over a decade. 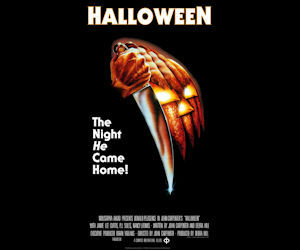 While not the first slasher film, Halloween became an enormous success story and reigned as the most profitable horror film from 1978 until 1999 (when The Blair Witch Project finally dethroned it, sparking a genre-wide revolution all its own). Without Michael Myers, there would probably be no Freddy Kreuger, Jason Vorhees, Chucky, or Pinhead (and Leatherface probably wouldn't have so many sequels to his name), which is why it's fitting that we are starting our summer-long exploration of the major slasher film franchises of the eighties with John Carpenter's Halloween, the movie that set the mold for all the others. So sit back, grab some popcorn, dim the lights, and welcome to The Unapologetic Geek's Slasher Summer. It's going to be a long ride, so let's get started by reviewing every film in the Halloween franchise, including the Myers-less Season of the Witch and the divisive Rob Zombie remakes. The Premise: Fifteen years after six-year-old Michael Myers murdered his sister on Halloween night, he escapes a mental institution and goes on a violent killing spree in his hometown of Haddonfield, Illinois, targeting teenage babysitter Laurie Strode and her friends. The Verdict: The original is a remarkable low-budget independent film that builds layer upon layer of suspense until a brutal final act. John Carpenter's classic gets credit for being a seminal work full of iconic moments that would be imitated for years, but it hasn't aged perfectly. While particularly effective at conveying vulnerability, Halloween is a slow burn full of inefficient storytelling that can be a bit of a slog. Jamie Lee Curtis does well with the character, but Laurie Strode only survives the film by sheer luck, lacking any kind of compelling character arc. However, Donald Pleasence's Dr. Loomis is the perfect mix of cheese and gravitas, pushing the narrative through its slower segments until the eventual bloodshed begins. 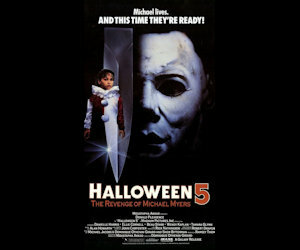 Myers, as a force of nature, is terrifying for his methodical nature punctuated by sudden bursts of merciless violence. Halloween helped define an entire genre for my generation, and despite its flaws, it deserves its place in the pantheon of landmark films. 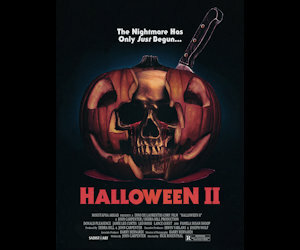 The Premise: Picking up immediately after the events of the first film, Halloween II sees Michael Myers pursuing Laurie Strode to the nearby hospital where the killing continues. The Verdict: This is more along the lines of what you think of when you think of an 80's slasher flick. It's less plodding than its predecessor, opting for more jump scares, blood, gore, dumb characters, and creative deaths instead of persistent suspense. As a result, it feels less ambitious, but more fun. 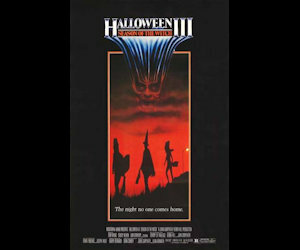 While competently made and perfectly entertaining, Halloween II does suffer from some significant problems, such as its lack of a clear protagonist (Laurie spends most of the movie lying in a hospital bed in a drugged stupor) and situations that are obviously contrived for the sake of the plot. Myers feels pretty different, too, acting more impulsive than methodical, and the twist reveal of his relationship to Laurie is unnecessary. The Premise: After a bizarre encounter at the hospital in which he works, Dr. Dan Challis sets about uncovering the mysteries of a Halloween mask manufacturer that has plans to slaughter tens of thousands of children. The Verdict: It's a shame the idea to turn the franchise into an anthology series didn't pan out, because this stand-alone entry isn't half bad. (I blame the film's marketing for not making it clear that this was a completely different story with no Michael Myers in it.) Dr. Challis is an outside-the-box protagonist--a middle-aged, womanizing, alcoholic, dead-beat dad--but character actor Tom Atkins plays him with just enough charisma to make him likeable. Sure, the whole thing has a B-movie vibe and the plot is really weird, but it works as a throwback to the sci-fi/horror of decades past. You half expect to see Charlton Heston running around screaming about green food ingredients. The bleak ending is what really makes it, tying together the thematic underpinnings of the story and delivering a pretty ballsy revelation. The Premise: Michael Myers escapes once again--ten years after the events of Halloween and Halloween II--when he learns that Laurie Strode, now dead, has a daughter who is still living in Haddonfield. 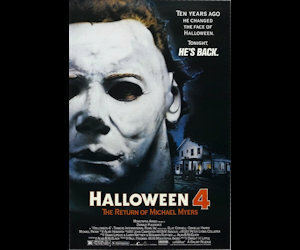 Dr. Loomis chases Myers back to the troubled town, again on Halloween night, hoping to stop him before he can kill again. The Verdict: This is the most competently made and well-acted entry in the series thus far, managing a careful balancing act between the suspense-fuelled first film and the bloody spectacle of the second. It capitalizes on the relentless nature of the antagonist to deliver the highest body count in the entire series, but it doesn't relish in the gore the way other slasher flicks--or even other Halloween movies--tend to do. It's harrowing without being cheesy, and while it is essentially a rehash of the first story without an ounce of originality, the ending is brilliantly shocking. The Return of Michael Myers is exactly what fans asked for, and as a faithful, unpretentious Halloween film, it's hard to do any better. The Premise: Having survived his apparent death, Michael Myers once again returns to Haddonfield in pursuit of his traumatized niece, Jamie Lloyd, who now resides in a children's hospital, suffering from seizures, hallucinations, and a terrifying psychic link to the mass murderer. The Verdict: It's shamefully disappointing that this film doesn't follow through on the previous one's conclusion, but that is hardly Halloween 5's biggest flaw. There's poor directing, lazy writing, and terrible sound editing throughout, and even Myers himself doesn't look right (the mask is way off). Also, unexplained psychic nonsense, hints at a convoluted larger mythos, appeals to Michael's humanity, and wacky idiot cops are not good additions. There are a few redeeming qualities--Donald Pleasence's take on the increasingly unhinged Dr. Loomis is pretty great and things pick up once the killing starts--but there's a lot of sloppiness getting there. It's easily the worst in the franchise up to this point (though it does get worse).